This post has 6,512 views. Another piece of electronics I bought during the Thanksgiving/Black Friday period was a car dash camera. As their names indicate, car dash cameras are installed in cars (sometimes on the dashboard) to record what the driver sees. It’s useful for providing evidence in the case of an accident, and also one can use the footage to make a travel movie or something. My dad wanted one of these things so I got one. Car dash cameras range from $20 all the way up to $300+, depending on the manufacturer and the features. I didn’t want to spend too much, so that pretty much limited the choices to some no-brand cameras of questionable reliability. I looked around and ended up getting the what is known as the F70/i1000 dual lens HD dash camera. These are Chinese-made, no-brand cameras that seem to come in various different names and configurations, but all feature a main unit with a small screen and a front lens that records at 1280x720px, and a long wire connected to a rear lens that records at 720x480px. Reviews on Amazon and other shopping places are not that great, with some people getting decent units and others getting bad ones, but I pulled the trigger anyways because this was the only model in that price range that had the features I wanted. Here are my first impressions. The box for the dash cam. The Dual-Lens Dash Camera came in a box that shows the dash camera itself and highlights some of the features. There is no brand name or model number on the box. Inside, we find the camera’s main unit on the top, and all of the other stuff in various baggies below. 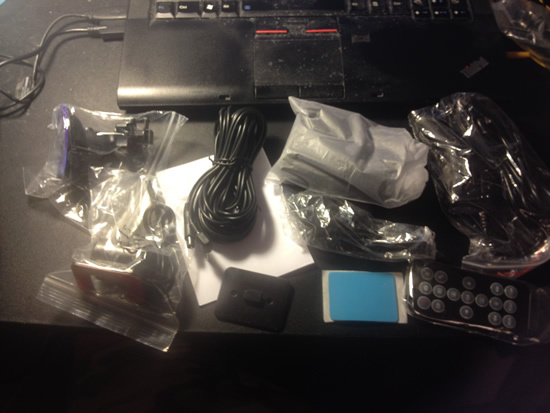 This particular Dual-Lens Dash Cam came with the rear lens and cable, a mini-USB data cable, a mini-USB car charger, a remote control (battery included), a manual, and both a suction cup mount and a sticky tape mount for the main unit. The rear lens has a sticky tape mount. The packaging isn’t the greatest and the box wasn’t sealed, but I’m not expecting much anyways. The dash cam comes with a good number of cables and attachments. The main unit is a small, with two buttons and a small 2-inch screen on the front. There are three indicator lights on the top right. The leftmost blue one is to indicate if the unit is on. The red one in middle tells if the unit is charging, and the blue one on the right tells you if the unit is recording. The front lens is on the lower right of the unit and it rotates on one axis, so you can have the lens record in front and behind the main unit. The left side has the power button, a connector for the rear lens a connector labelled AV-OUT, but wasn’t any video cables in the box. There are three buttons and the microSD slot on the top, and the mini-USB socket for charging and data is on the right. My first impression of the dash cam isn’t that good. The main unit has a grey plastic casing that doesn’t look or feel very well made. There are also some scratches on the screen which could mean that I got a used unit. The build quality looks pretty suspect. I tested out the Dual-Lens Dash Camera by powering it with my laptop’s USB port. If the camera detects it’s connected to a computer, it will show a menu with three choices. Choice 1 is to act as a USB disk and let the computer access the video clips in its microSD card. Choice 2 is to act as a webcam (which didn’t work as my laptop couldn’t find the drivers). Finally choice 3 is just to charge and act like a dash camera. I chose the third otpion, and thankfully the camera turns on, and both the front and rear cameras work. By default, the screen shows the rear camera image in the upper right while the front camera footage takes up the rest of the screen, but this can be changed by pressing the buttons. I’ve read online that many people got units with the Chinese menu and had a hard time figuring out how to change it to English. The one I have came with the English menu, but I changed it to Chinese since the English menu doesn’t seem to be worded very well. The same goes for the user manual. The manual comes in English and Chinese, and the English version looks like a Google translate of the Chinese version. 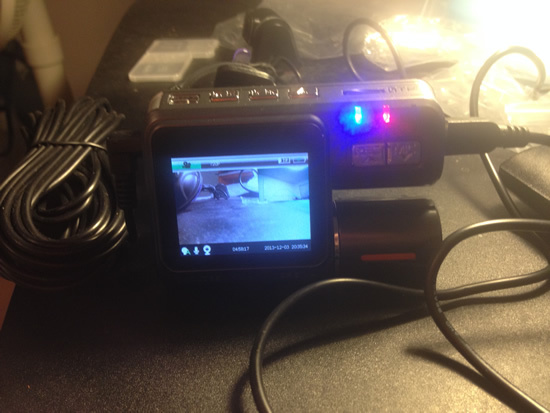 The dash cam in operation, showing both the front and rear lens footage. The basic operations of the camera is pretty simple, and by default it will turn on and start recording when connected to a power source. Similarly, it’ll turn off by itself if the power source is gone. The video clips are recorded in 1, 2 or 5 minute increments onto the microSD card, and the dash cam will automatically delete old videos to make room for new ones if the card becomes full. My Dual-Lens Dash Camera records videos in .mov (Quicktime Movie) format. A minute of the front lens video is about 33MB, while a minute from the rear lens is about half of that at 16.5MB. With the 16GB microSDHC card I bought for this dash cam, the camera should be able to record more than 5 hours of footage before the overwriting begins. I haven’t tested to to see if the overwriting works. On the microSD card, the front camera and rear camera footage are organized into two different folders, and all of the videos have the starting time stamp as their names for easy identification. While testing the camera at home, I found on some occasions that the rear camera would fail to record to the SD card. The files are created on the card, but they have zero bytes. I’ve only seen that issue twice though, and it didn’t happen when I took the camera in my car. In addition to basic recording, recording can be started manually. The camera has an internal battery that allows it to operate when not plugged in. I didn’t test the battery life extensively, but first impressions is that the battery doesn’t last very long. The Dual Lens Dash Camera can also be set to start recording on motion, but I haven’t tried it. Finally, the remote control can used to operate the unit. There is a pretty good video review of this type of F70/i1000 dash camera, and the one I got operates mostly the same way. The difference between that review and my unit is that the date-time display on the video in my camera is a lot more readable, with green numbers over a black background. The rear camera video also contains some green lines that help people back up and reverse into parking spots, although this dash cam’s screen is a little too small to be used as a real rear-view back-up camera. 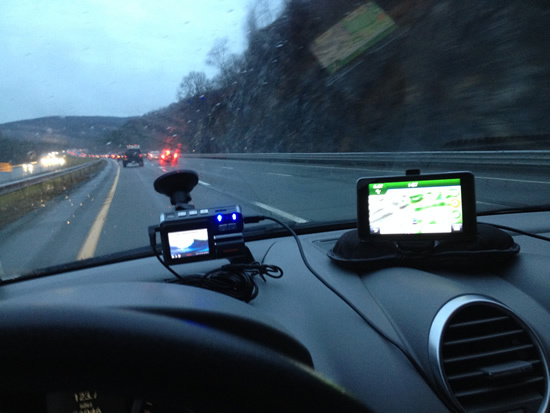 I took both the dual-lens dash cam and the Garmin nuvi 3490 GPS for a test drive. I took the Dual-Lens Dash Camera on a pretty long drive and recorded both day time and night time footage with both the front and rear cameras. I uploaded a minute of the day time front camera footage to YouTube which you can see below. From what I saw, the front camera footage is okay but is slightly blurry. Of course, it was a rainy day and my windshield is not the cleanest, but the video isn’t that sharp regardless. You’ll have a hard time reading a license plate unless the car is within 10 feet of your car. The front lens is a wide angle lens, so you do get a wide area of view which is a plus for a dash cam. I didn’t upload any rear camera footage since I didn’t install it to the rear window of my car, but the footage is not as good as the front camera due to the lower resolution. Considering the cost of the unit though, the day time recordings aren’t too bad. At night time, the dash cam wasn’t able to see much unless the streets are very well-lit. On the Interstate all the front camera recorded was head lights and tail lights. My first impressions of the Dual-Lens Dash Camera is okay. The device seems cheaply made and the main unit might be used, but it does what it is supposed to do. The video quality is not too bad considering the cost of the unit. Hopefully this little dash cam will last after it gets installed in my parents’ car. After a couple months of operation, the camera sometimes gets stuck in a cycle of repeatedly starting up and shutting down. Stopping the cycle involves removing the memory card or unplugging the cam and letting the batteries run out. The problem is related to heat and exposure of the dash cam to the sun. Looks like the build quality inside is just as it looks outside: not very good. Great review! thank you for sharing. 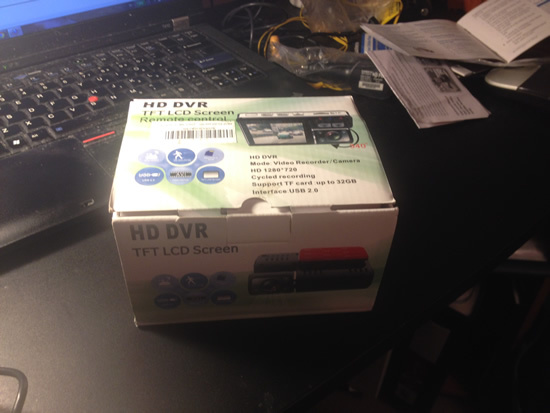 We were looking to sell this as well but honestly, the front does not appear to be real 720P (HD). Are you sure this is correct model? and the rear VGA would be useless at night since it’ll be very dark, and camera will be struggling to manage in low light conditions. Hi, great review thank you. Not sure if our other comment went through. But is that front camera actual 720P? (High Definition) because judging from the quality it appears VGA. Also rear camera VGA would be quite useless at night since camera would struggle to make out registration plates for example. The video is 1280×720, but I don’t know if the sensor is actually HD or not. As you can see, the video quality isn’t great. The rear cam is considerably worse though, especially at night. Thanks for clearing that. Considering it is 1280×720, then it is technically HD high definition, although you raise a good point regarding the sensor. Yes lol quite obviously the video isn’t top notch but made me curious to ask this issue with you. Kind regards, Austin. Thanks for this review! Definitely given me some food for thought! Hello & thanks for the review & its details, I picked up one of these from Ebay. Initialy I could not get to display the rear camera. however for one reason or another, it started working. but now, it stopped again. The LED in rear lens light up but the display does not want to switch and show the rear camera. it might be a software bug and I have reset it multiple time but not luck. any idea? Thanks for reading my review. These cameras are pretty cheaply made and not known to be particularly reliable, so I’m not surprised you have problems with it. Can’t really help you diagnose the problem though. Thank you for a nicely written detailed explanation. I was interested in buying a dash cam. I have read the review. It helps me a lot Thanks. Great post.